The Great Massacre of 1391. Capital of Catalonia, Spain; much praised by Jewish travelers and poets for its beauty and its picturesque situation; was inhabited by Jews as early as the ninth century. According to tradition, the Jews dwelling there assisted the Arabs in the conquest of the city. The favorite of Charles the Bald (815-817), Judah ("Judas Hebræus, fidelis noster"), settled in Barcelona, his arrival being announced to the inhabitants by a letter from the king's own hand. At the time of the count Ramon Berenguer I. (1035-65), the Jews of Barcelona were already landowners; among them are mentioned R. Makir and a certain Reuben, who had his estate at the foot of Monjuich. 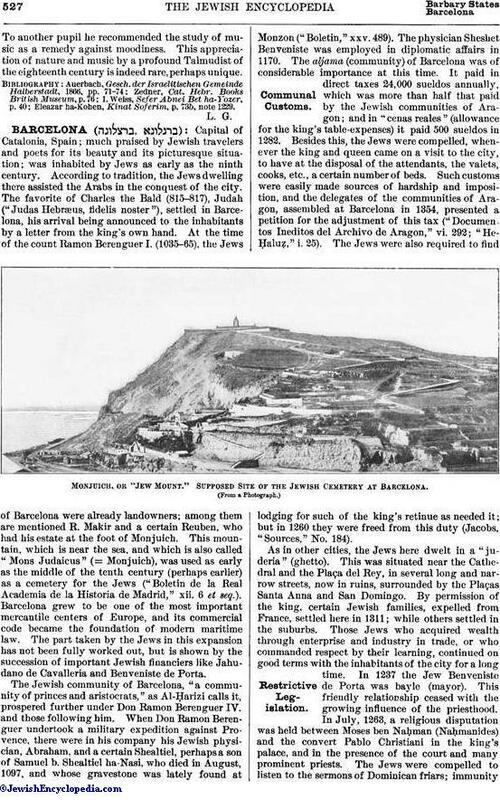 This mountain, which is near the sea, and which is also called "Mons Judaicus" (= Monjuich), was used as early as the middle of the tenth century (perhaps earlier) as a cemetery for the Jews ("Boletin de la Real Academia de la Historia de Madrid," xii. 6 et seq.). Barcelona grew to be one of the most important mercantile centers of Europe, and its commercial code became the foundation of modern maritime law. The part taken by the Jews in this expansion has not been fully worked out, but is shown by the succession of important Jewish financiers like Jahudano de Cavalleria and Benveniste de Porta. The Jewish community of Barcelona, "a community of princes and aristocrats," as Al-Ḥarizi calls it, prospered further under Don Ramon Berenguer IV. and those following him. When Don Ramon Berenguer undertook a military expedition against Provence, there were in his company his Jewish physician, Abraham, and a certain Shealtiel, perhaps a son of Samuel b. Shealtiel ha-Nasi, who died in August, 1097, and whose gravestone was lately found at Monzon ("Boletin," xxv. 489). The physician Sheshet Benveniste was employed in diplomatic affairs in 1170. The aljama (community) of Barcelona was of considerable importance at this time. It paid in direct taxes 24,000 sueldos annually, which was more than half that paid by the Jewish communities of Aragon; and in "cenas reales" (allowance for the king's table-expenses) it paid 500 sueldos in 1282. Besides this, the Jews were compelled, whenever the king and queen came on a visit to the city, to have at the disposal of the attendants, the valets, cooks, etc., a certain number of beds. Such customs were easily made sources of hardship and imposition, and the delegates of the communities of Aragon, assembled at Barcelona in 1354, presented a petition for the adjustment of this tax ("Documentos Ineditos del Archivo de Aragon," vi. 292; "He-Ḥaluẓ," i. 25). The Jews were also required to find lodging for such of the king's retinue as needed it; but in 1260 they were freed from this duty (Jacobs, "Sources," No. 184). Monjuich, or "Jew Mount." Supposed Site of the Jewish Cemetery at Barcelona. As in other cities, the Jews here dwelt in a "juderia" (ghetto). This was situated near the Cathedral and the Plaça del Rey, in several long and narrow streets, now in ruins, surrounded by the Plaças Santa Anna and San Domingo. By permission of the king, certain Jewish families, expelled from France, settled here in 1311; while others settled in the suburbs. Those Jews who acquired wealth through enterprise and industry in trade, or who commanded respect by their learning, continued on good terms with the inhabitants of the city for a long time. In 1237 the Jew Benveniste de Porta was bayle (mayor). This friendly relationship ceased with the growing influence of the priesthood. In July, 1263, a religious disputation was held between Moses ben Naḥman (Naḥmanides) and the convert Pablo Christiani in the king's palace, and in the presence of the court and many prominent priests. The Jews were compelled to listen to the sermons of Dominican friars; immunityfrom attendance upon such occasions could be purchased only at large figures. Inspired by the priesthood, exceptional laws were passed against them, and statutes already existing were rendered more stringent. Jews were forbidden to live outside of the juderia, or even to seek temporary shelter in the house of a Christian. No convert to Christianity, no Christian woman, could enter the juderia, which was kept closed during every Good Friday. Christian women were not permitted to visit the house of a Jewess by night or by day. A decree, issued April 11, 1302, compelled a Jew or a Jewess, meeting a priest with the sacrament, to kneel down in the street. Trading in Christian prayer-books and holy pictures was strictly forbidden them. They were not permitted to sell the ritually slaughtered (kosher) meat anywhere outside of the juderia or at the entrance to it. In 1338 a nobleman named Jordan de Illa wished to celebrate a "divinum mysterium" at the house of the wealthy Samuel Benveniste. As soon as the king, Pedro the Elder, heard of this, he had Benveniste imprisoned and his estates confiscated, "to serve as a warning to other Jews." At the head of the aljama were thirty men, elected by the members of the community and confirmed by the king. They were the administrators and secretaries, to whom were added official auditors and a manager of the poorhouse. According to the statutes, the election of three members took place every three years under the management of the three departing members and by the vote of the majority. These three election-managers were required to take oath in the presence of ten members of the community, and holding the Torah in their arms, to promise that they would faithfully carry out the election to the best interests of the community; and that they would consult nobody. The election often led to dissensions and to rupture in the aljama (see Responsa of Isaac b. Sheshet, Nos. 214 and 228). The religious affairs of the community were under the guidance of several famous rabbis, as Abraham b. Ḥasdai, son of Samuel b. Abraham b. Ḥasdai; and Solomon ben Adret, whose contemporary, Aaron ha-Levi, also lived in Barcelona. 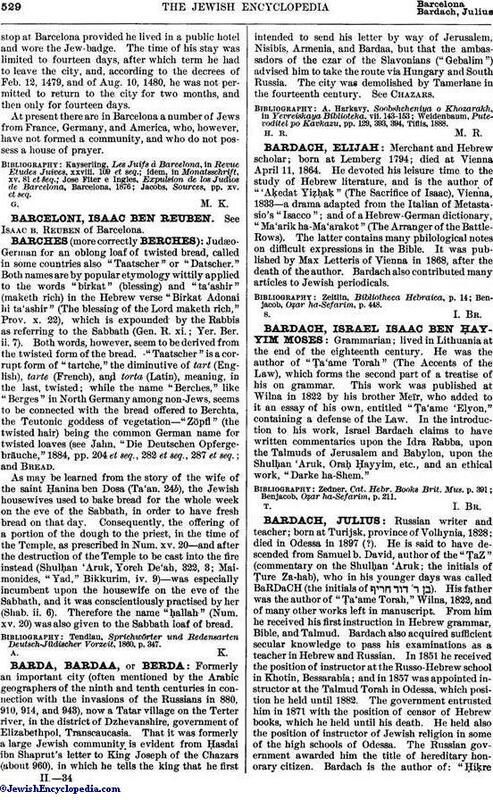 The following personages among many others that could be mentioned were born in Barcelona: Isaac b. Reuben, called "al-Bargeloni" (the Barcelonian); Judah b. Barzilai, author of the valuable "Sefer ha-'Ittim"; Abraham b. Ḥiyya ha-Nasi; the poet Joseph ibn Sabara; Ḥasdai Crescas. Astruc Bonsenyor and Judah Bonsenyor, his son, scholars and physicians, enjoyed the respect of the court of Aragon. The Jewish community of Barcelona came to a disastrous end, earlier than any other in Spain. The disastrous year 1348 did not pass without leaving its traces. Toward the end of June, on a Sabbath eve, the mob banded together against the Jews, killed twenty, and plundered the Jewish houses. Meanwhile the nobility and some prominent citizens espoused the cause of the Jews, and dispersed the deluded crowd the more easily because a fearful storm accompanied by terrible lightning set in, and the rain poured down in streams (Joseph ha-Kohen, "'Emeḳ ha-Baḳa," p. 66). In 1391, during the great persecutions which began at Seville and spread over all Jewish communities of Spain, the community of Barcelona was destroyed. Three days after the massacre at Palma in Majorca, on Saturday, August 5, 1391, on the feast of San Dominic, two vessels containing fifty Castilians landed at Barcelona. As if by appointment, those who landed rushed, with the native sailors, laborers, peasants, and women, into the Calle Mayor, the principal street of the juderia, and murdered and plundered indiscriminately the entire night long and all of the following day. In the first assault, a hundred Jews lost their lives; the rest fled to the Castello Nuevo, which, with the juderia, was manned by troops by order of the governor. Several of the Castilians were imprisoned; and the city council acquiesced in the suggestion of the governor and the most prominent citizens to have them forthwith executed as ringleaders. The enraged citizens angrily protested against this decision, and attacked the governor and the members of the council. One of the latter was killed, and several others seriously injured. The infuriated mob forced an entrance into the prison and freed the condemned. The castle was taken by storm; all Jews that had not left it—about three hundred in number—were killed. Many committed suicide, many threw themselves from the wall or lost their lives in frenzied combat with their assailants. A great number—though not eleven thousand as Grätz has it ("Geschder Juden," viii. 68)—accepted baptism as salvation ("Revue Etudes Juives," iv. 57 et seq.). At first the king of Aragon decided, by a decree dated Sept. 10, 1392, to abolish the Jewish community of Barcelona forever. 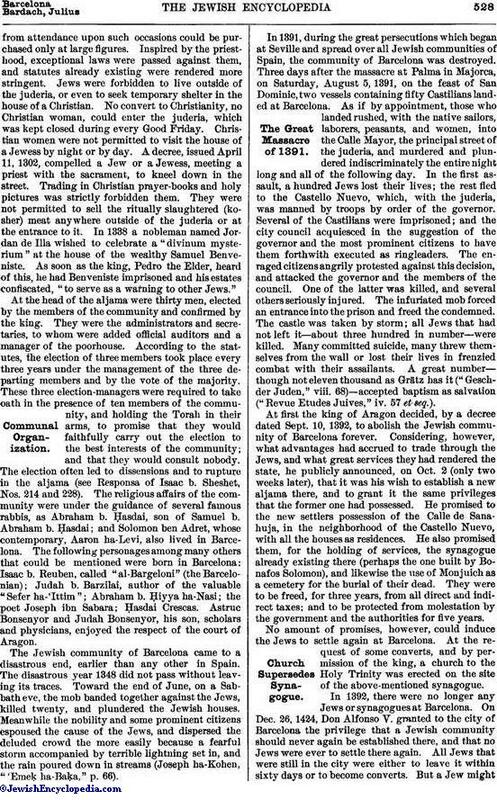 Considering, however, what advantages had accrued to trade through the Jews, and what great services they had rendered the state, he publicly announced, on Oct. 2 (only two weeks later), that it was his wish to establish a new aljama there, and to grant it the same privileges that the former one had possessed. He promised to the new settlers possession of the Calle de Sanahuja, in the neighborhood of the Castello Nuevo, with all the houses as residences. He also promised them, for the holding of services, the synagogue already existing there (perhaps the one built by Bonafos Solomon), and likewise the use of Monjuich as a cemetery for the burial of their dead. They were to be freed, for three years, from all direct and indirect taxes; and to be protected from molestation by the government and the authorities for five years. No amount of promises, however, could induce the Jews to settle again at Barcelona. At the request of some converts, and by permission of the king, a church to the Holy Trinity was erected on the site of the above-mentioned synagogue. In 1392, there were no longer any Jews or synagogues at Barcelona. On Dec. 26, 1424, Don Alfonso V. granted to the city of Barcelona the privilege that a Jewish community should never again be established there, and that no Jews were ever to settle there again. All Jews that were still in the city were either to leave it within sixty days or to become converts. But a Jew mightstop at Barcelona provided he lived in a public hotel and wore the Jew-badge. The time of his stay was limited to fourteen days, after which term he had to leave the city, and, according to the decrees of Feb. 12, 1479, and of Aug. 10, 1480, he was not permitted to return to the city for two months, and then only for fourteen days. At present there are in Barcelona a number of Jews from France, Germany, and America, who, however, have not formed a community, and who do not possess a house of prayer. Jacobs, Sources, pp. xv. et seq.